M (US 10-12):---Bust--36.5" Length--25.5" Sleeve--7.8" Shoulder--15.3"
L (US 14):--------Bust--38.5" Length--26.3" Sleeve--8.2" Shoulder--15.8"
XL (US 16):------Bust--41.3" Length--27.1" Sleeve--8.6" Shoulder--16.5"
XXL(US 18):-----Bust--44.0" Length--27.9" Sleeve--9.0" Shoulder--17.2"
Occasion:Daliy wear, office, shopping, sports, beach vacation, home,work. etc. 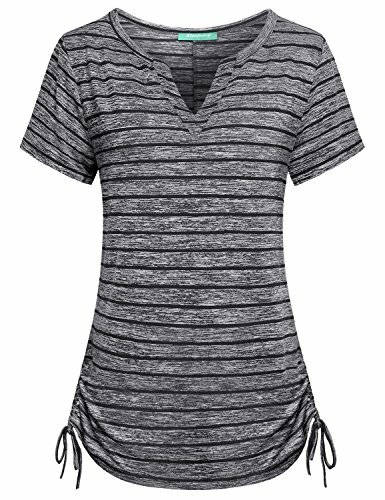 This elegant shirt pairs well with capris, shorts,jeans or other skinny pants. Black-2: 15%Rayon,15%Polyester,20%Slub Yarn,50%Paragraph indentation silk.